This article is about a 1913 stage performance. For for other stage performances, see Pygmalion. Shaw wrote the play in early 1912 and read it to famed actress Mrs. Patrick Campbell in June. She came on board almost immediately, but her mild nervous breakdown contributed to the delay of a London production. 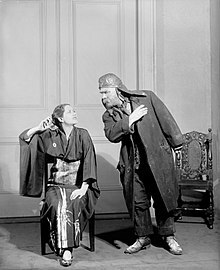 Pygmalion premiered at the Hofburg Theatre in Vienna on 16 October 1913, in a German translation by Shaw's Viennese literary agent and acolyte, Siegfried Trebitsch. Its first New York production opened on 24 March 1914 at the German-language Irving Place Theatre. It opened in London on 11 April 1914, at Sir Herbert Beerbohm Tree's His Majesty's Theatre and starred Mrs. Campbell as Eliza and Tree as Higgins, running for 118 performances. Shaw directed the actors through tempestuous rehearsals often punctuated by at least one of the two storming out of the theatre in a rage. Pygmalion was the most broadly appealing of all Shaw's plays. But popular audiences, looking for pleasant entertainment with big stars in a West End venue, wanted a "happy ending" for the characters they liked so well, as did some critics. During the 1914 run, to Shaw's exasperation but not to his surprise, Tree sought to sweeten Shaw's ending to please himself and his record houses. Shaw returned for the 100th performance and watched Higgins, standing at the window, toss a bouquet down to Eliza. "My ending makes money; you ought to be grateful," protested Tree, to which Shaw replied, "Your ending is damnable; you ought to be shot." Shaw remained sufficiently irritated to add a postscript essay, "'What Happened Afterwards," to the 1916 print edition for inclusion with subsequent editions, in which he explained precisely why it was impossible for the story to end with Higgins and Eliza getting married. When Eliza emancipates herself – when Galatea comes to life – she must not relapse. She must retain her pride and triumph to the end. When Higgins takes your arm on 'consort battleship' you must instantly throw him off with implacable pride; and this is the note until the final 'Buy them yourself.' He will go out on the balcony to watch your departure; come back triumphantly into the room; exclaim 'Galatea!' (meaning that the statue has come to life at last); and – curtain. Thus he gets the last word; and you get it too. Shaw fought against a Higgins-Eliza happy-end pairing as late as 1938. He sent the 1938 film version's producer, Gabriel Pascal, a concluding sequence which he felt offered a fair compromise: a tender farewell scene between Higgins and Eliza, followed by one showing Freddy and Eliza happy in their greengrocery-flower shop. Only at the sneak preview did he learn that Pascal had finessed the question of Eliza's future with a slightly ambiguous final scene in which Eliza returns to the house of a sadly musing Higgins and self-mockingly quotes her previous self announcing, "I washed my face and hands before I come, I did". Different printed versions of the play omit or add certain lines. The Project Gutenberg version published online, for instance, omits Higgins' famous declaration to Eliza, "Yes, you squashed cabbage-leaf, you disgrace to the noble architecture of these columns, you incarnate insult to the English language! I could pass you off as the Queen of Sheba!" – a line so famous that it is now retained in nearly all productions of the play, including the 1938 film version of Pygmalion as well as in the stage and film versions of My Fair Lady. The co-director of the 1938 film, Anthony Asquith, had seen Mrs. Campbell in the 1920 revival of Pygmalion and noticed that she spoke the line, "It's my belief as how they done the old woman in." He knew "as how" was not in Shaw's text, but he felt it added color and rhythm to Eliza's speech, and liked to think that Mrs. Campbell had ad libbed it herself. Eighteen years later he added it to Wendy Hiller's line in the film. The 1938 film also introduced the famous pronunciation exercises "the rain in Spain stays mainly in the plain" and "In Hertford, Hereford, and Hampshire, hurricanes hardly ever happen". Neither of these appears in the original play. Shaw's screen version of the play as well as a new print version incorporating the new sequences he had added for the film script were published in 1941. The scenes he had noted in "Note for Technicians" are added. 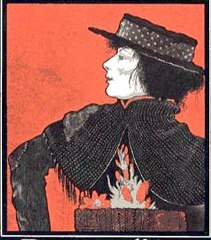 Pygmalion remains Shaw's most popular play. The play's widest audiences know it as the inspiration for the highly romanticized 1956 musical and 1964 film My Fair Lady. Pygmalion has transcended cultural and language barriers since its first production. The British Museum contains "images of the Polish production...; a series of shots of a wonderfully Gallicised Higgins and Eliza in the first French production in Paris in 1923; a fascinating set for a Russian production of the 1930s. There was no country which didn't have its own 'take' on the subjects of class division and social mobility, and it's as enjoyable to view these subtle differences in settings and costumes as it is to imagine translators wracking their brains for their own equivalent of 'Not bloody likely'." Joseph Weizenbaum named his chatterbot computer program ELIZA after the character Eliza Doolittle. Peter Hogg's novel Smilla's Sense of Snow features a "Professor Higgins" character - i.e., a skilled linguist able to deduce a person's geographical and social circumstances from hearing them speak; in that case, Hogg's linguist is an expert on the Inuit languages and dialects of Greenland, but is equally at home in identifying at a glance the various dialects and sociolects of Danish. Julie Andrews as flower girl Eliza Doolittle meets Rex Harrison as Professor Henry Higgins in the 1956 musical adaptation of Pygmalion, My Fair Lady. 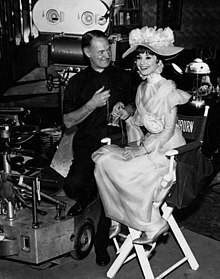 Cinematographer Harry Stradling poses with Audrey Hepburn as Eliza Doolittle on the set of the 1964 movie musical My Fair Lady. Pygmalion (1935), a German film adaptation by Shaw and others, starring Gustaf Gründgens as Higgins and Jenny Jugo as Eliza. Directed by Erich Engel. Pygmalion (1937), a Dutch film adaptation, starring Johan De Meester as Higgins and Lily Bouwmeester as Elisa. Directed by Ludwig Berger. Kitty (1945), a film based on the novel of the same name by Rosamond Marshall (published in 1943). A broad interpretation of the Pygmalion story line, the film tells the rags-to-riches story of a young guttersnipe, Cockney girl. Selfie, a 2014 television sitcom on ABC, starring Karen Gillan and John Cho. Classic Alice, a webseries, aired a 10-episode adaptation on YouTube, starring Kate Hackett and Tony Noto in 2014. Totalmente Demais, a 2015 Brazilian telenovela, starring Juliana Paes, Marina Ruy Barbosa and Fábio Assunção. Pigmalió, an adaptation by Joan Oliver into Catalan. Set in 1950s Barcelona, it was first staged in Sabadell in 1957 and has had other stagings since. Ti Phulrani, an adaptation by Pu La Deshpande in Marathi. The plot follows Pygmalion closely but the language features are based on Marathi. Santu Rangeeli, an adaptation by Madhu Rye and Pravin Joshi in Gujarati. A 1996 television play in Polish, translated by Kazimierz Piotrowski, directed by Maciej Wojtyszko and performed at Teatr Telewizji (Polish Television studio in Warsaw) by some of the top Polish actors at the time. It has been aired on national TV numerous times since its TV premiere in 1998. Hoi Polloi (1935), a film adaptation by The Three Stooges. Willy Russell's 1980 stage comedy Educating Rita and the subsequent film adaptation are similar in plot to Pygmalion. The First Night of Pygmalion (1972), a play depicting the backstage tensions during the first British production. Trading Places (1983), a film starring Eddie Murphy and Dan Aykroyd. Pretty Woman (1990), a film starring Julia Roberts and Richard Gere. Confessions of a Teenage Drama Queen (2004), a film starring Lindsay Lohan where she auditions for a modernized musical version of Pygmalion called "Eliza Rocks". Moonlighting's second-season episode "My Fair David" (1985) is inspired by the movie My Fair Lady, in a plot where Maddie Hayes makes a bet with David Addison consisting in making him softer and more serious with work. She is her Henry Higgins, while he is put in the Eliza Doolittle position, as the funny, clumsy, bad-mannered part of the relationship. The Man from U.N.C.L.E. 's third-season episode "The Galatea Affair" (1966) is a spoof of My Fair Lady. A crude barroom entertainer (Joan Collins) is taught to behave like a lady. Noel Harrison, son of Rex Harrison, star of the My Fair Lady film, is the guest star. In The Beverly Hillbillies episode "Pygmalion and Elly" Sonny resumes his high-class courtship of Elly May by playing Julius Caesar and Pygmalion. In The Andy Griffith Show season 4 episode "My Fair Ernest T. Bass", Andy and Barney attempt to turn the mannerless Ernest T. Bass into a presentable gentleman. References to "Pygmalion" abound: Bass' manners are tested at a social gathering, where he is assumed by the hostess to be a man from Boston. Several characters comment "if you wrote this into a play nobody'd believe it." In Doctor Who, the character of Leela is loosely based on Eliza Doolittle. She was a regular in the programme from 1977 to 1978, and later reprised in audio dramas from 2003 to present. In Ghost Light, the character of Control is heavily based upon Eliza Doolittle, with Redvers Fenn-Cooper in a similar role as Henry Higgins; the story also features reference to the "Rain in Spain" rhyme and the Doctor referring to companion Ace as "Eliza". In the Remington Steele season 2 episode "My Fair Steele", Laura and Steele transform a truck stop waitress into a socialite to flush out a kidnapper. Steele references the 1938 movie Pygmalion and My Fair Lady, and references the way in which Laura has "molded" him into her fictional creation. In the Magnum, P.I. episode "Professor Jonathan Higgins" of Season 5, Jonathan Higgins tries to turn his punk rocker cousin into a high society socialite. Higgins even references Pygmalion in the episode. The Family Guy episode "One If By Clam, Two If By Sea" involves a subplot with Stewie trying to refine Eliza Pinchley, his new Cockney-accented neighbor, into a proper young lady. He makes a bet with Brian that he can improve Eliza's vocabulary and get her to speak without her accent before her birthday party. Includes "The Life of the Wife", a parody of the song "The Rain in Spain" (from My Fair Lady). The voice of Stewie was in fact originally based on that of Rex Harrison. The plot of the Star Trek: Voyager episode "Someone to Watch Over Me" is loosely based on Pygmalion. Pygmalion is the inspiration for The Simpsons episode entitled "Pygmoelian," in which infamously ugly character Moe, of Moe's Tavern, has a facelift. It was also parodied to a heavier extent in the episode "My Fair Laddy", where the character being changed is uncouth Scotsman Groundskeeper Willie. In the Boy Meets World episode "Turnaround", Cory and Shawn learn about "Pygmalion" in class, paralleling their attempt with Cory's uncool date to the dance. The iCarly episode "iMake Sam Girlier" is loosely based on Pygmalion. The Season 7 King of the Hill episode "Pigmalian" describes an unhinged local pig magnate who attempts to transform Luanne into the idealized woman of his company's old advertisements. In The King of Queens episode "Gambling N'Diction" Carrie tries to lose her accent for a job promotion by being taught by Spence. The episode was renamed to "Carrie Doolittle" in Germany. In 2014, ABC debuted a romantic situational comedy titled Selfie, starring Karen Gillan and John Cho. It is a modern-day adaptation that revolves around an image-obsessed woman named Eliza Dooley (Gillan) who comes under the social guidance of marketing image guru Henry Higgs (Cho). In the Malaysian drama Nur, Pygmalion themes are evident. The lives of a pious, upstanding man and a prostitute are considered within the context of Islam, societal expectations and norms. ^ "Theses & Conference Papers". Archived from the original on 24 September 2015. ^ "Herr G.B. Shaw at the Irving Place." The New York Times 25 March 1914. In late 1914 Mrs Campbell took the London company to tour the United States, opening in New York at the Belasco Theatre. ^ "The Modest Shaw Again: Explains in His Shrinking Way Why "Pygmalion" Was First Done in Berlin ;- Critics Like It". New York Times. 23 November 1913 – via Proquest. ^ "Shaw's 'Pygmalion' Has Come to Town: With Mrs. Campbell Delightful as a Galatea from Tottenham Court Road – A Mildly Romantic G. B. S. – His Latest Play Tells a Love Story with Brusque Diffidence and a Wealth of Humor". New York Times. 13 October 1914. Retrieved 19 September 2016 – via Proquest. ^ "Pygmalion, His Majesty's Theatre, 1914, review". The Telegraph. 11 April 2014. Retrieved 19 September 2016 – via The Telegraph. ^ "The Story Of "Pygmalion."". The Times. 19 March 1914. Retrieved 19 September 2016 – via Gale. ^ Shaw–Campbell Correspondence, p. 160. Shaw's "Final Orders" letter to Mrs. Campbell on the first night. He wrote to his wife the next day that the audience's wild appreciation of the third act – which he had warned the actors would happen – impelled Tree instinctively to begin playing to please the house, much to Shaw's disgust but to the play's guaranteed popular success. Collected Letters, vol. III. The same day he withdrew his recommendation to Lee Shubert that Tree be included in an American tour. ^ "The Project Gutenberg E-text of Pygmalion, by George Bernard Shaw". ^ Tointon's indisposition on 25 August 2011 enabled understudy Rebecca Birch to make her West End début in a leading role (insert to Garrick Theatre programme for Pygmalion). ^ "Julia Stiles Stars in The Makeover". 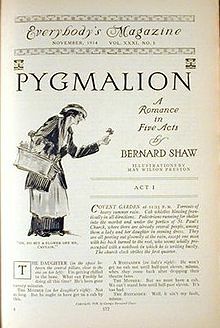 Wikimedia Commons has media related to Pygmalion (Shaw). Pygmalion stories & art: "successive retellings of the Pygmalion story after Ovid's Metamorphoses"
"Bernard Shaw Snubs England and Amuses Germany." The New York Times, 30 November 1913. This article quotes the original script at length ("translated into the vilest American": Letters to Trebitsch, p. 170), including its final lines. Its author, too, hopes for a "happy ending": that after the curtain Eliza will return bearing the gloves and tie.